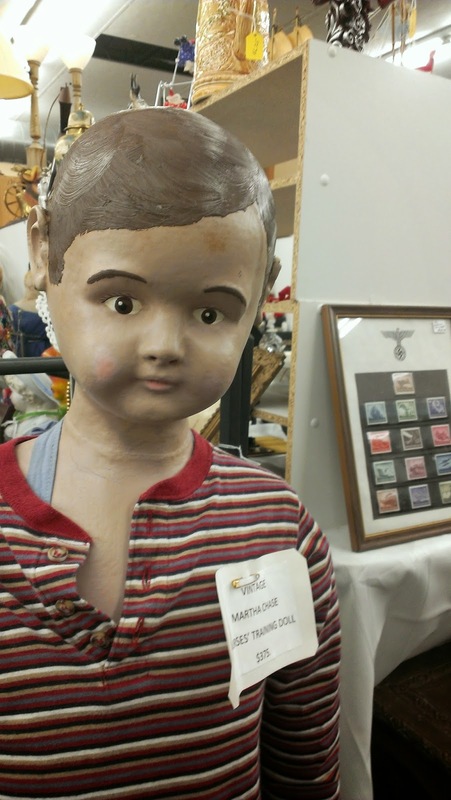 For those not familiar with the term, Uncanny Valley refers to a hypothesis that when something looks or acts almost human, it invokes a sense of revulsion. This explains why many people have a strong, visceral fear of Bjork. Not actually Bjork. I didn't want to get sued. Or punched. When it comes to robots, this is especially true. This is why we have no problem with the weird, obviously mechanical robot from Lost in Space, but Twiki, the robot from Buck Rogers, with his dead, dead eyes, gave some of us the willies. Even more unnerving are entirely too life like robots that have been popping up at tech shows for the last decade or so. Personally, I don't get it. Yes, I love the clunky metallic machine men for their vintage charm. And yes, if I had to deal with a Commander Data style android I might want to punch him in the nose, but the humanoid robots fascinate me. I would love to have the opportunity to speak with one someday, if for no other reason than to see how long it takes for me to forget that they aren't a person. I tried to tell her that matte lipstick was all the rage, but did she listen? Ug, robots! Oddly enough, I got to take a bit of a trip through the Valley a few weeks ago. The natives were bored. Not even their hobby of sewing fancy corsets held joy anymore. We traveled to NY for my brother's wedding. While we were at my parents' house, we caught an episode of The Twilight Zone. It was one where a prisoner being held on an asteroid falls in love with a humanoid robot (pronounced robit in that quirky, old timey way). I'm sure it was freaky at the time, but to me it was a sad story because the robit meets an untimely demise. Funny though, in a way, all of the old Twilight Zone episodes seem to take place in the Uncanny Valley, at least they do now. The acting and manner of speaking from that era is just different enough from today to be almost human. But again, this doesn't bother me. Neither do realistic mannequins, and we saw plenty of them on this trip as well. Well, that's not true. 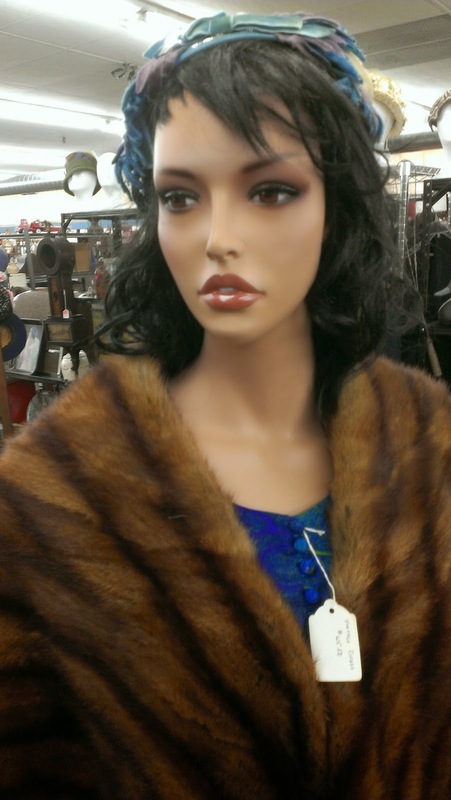 Full mannequins don't bother me, but those disembodied heads that hold wigs give me the heebie jeebies. Apparently, this poor fella has seen things we wouldn't believe. He also suffers from a bad case of the heebie jeebies. Is that a rickrack battle scar? Typically, I don't have pediophobia, but apparently my sister does, thanks in part to the movie, The Conjuring. 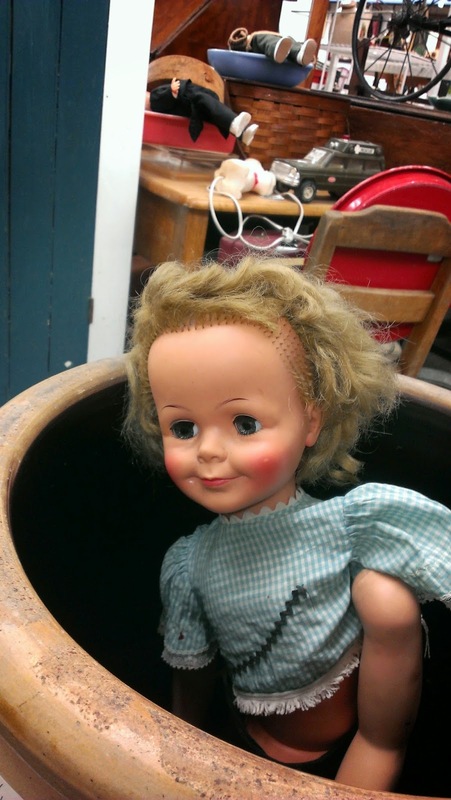 She happened to mention this when I said I was going into an antique mall, which freaked her out because of all the dolls. 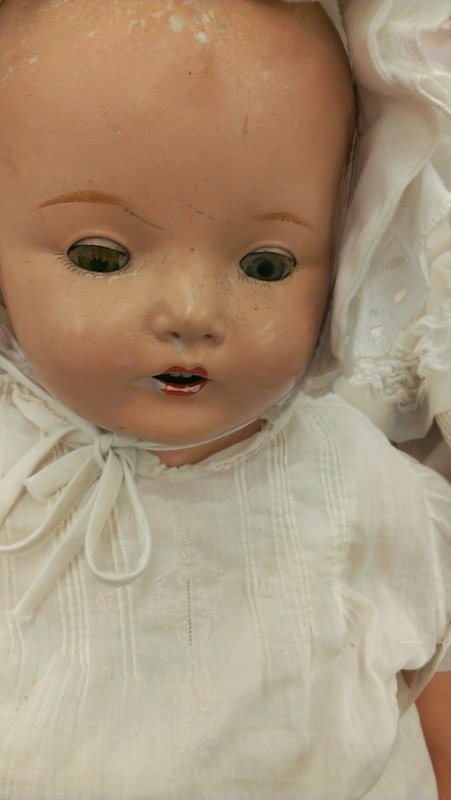 Because big sisters never change, no matter how old or how mature they are supposed to be, I purposefully went looking for the creepiest dolls in the mall and took pictures of them all. My intention was to randomly text her these pictures, preferably at three in the morning* because... well, see my last sentence. I imagine her expression might look like this. 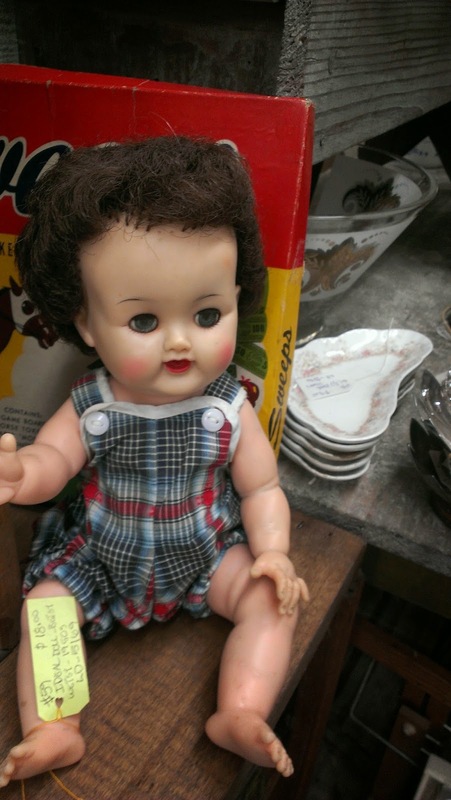 But after about three dozen very creepy dolls, I did start to realize the the Uncanny Valley might be real. 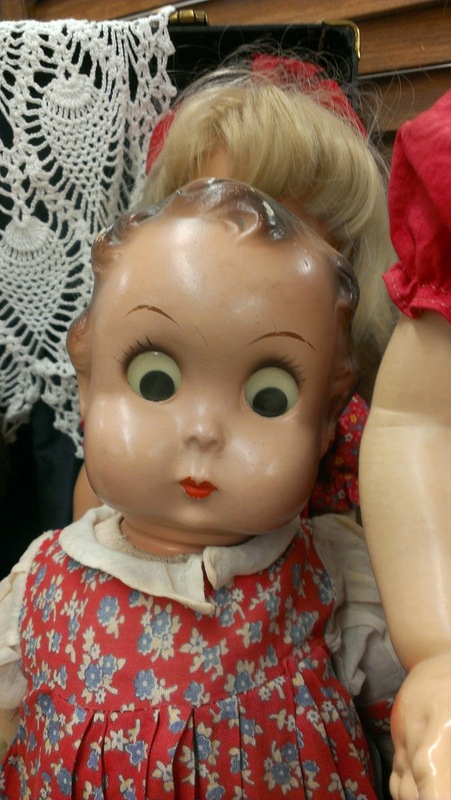 I had to admit, some of the better dolls, the hand crafted, painstakingly detailed dolls that were probably once the cherished possessions of rich little girls, were in fact, quite a bit creepier than their cheap, cartoonish counterparts. Admit it, if she started crying, you would be the one with wet pants. So now I have to wonder, how would I really feel about talking to that robot? Would it still be a cool experience or would I feel slightly unnerved? Would I feel threatened? Or would I have a strange and sudden desire to watch Bjork videos? I guess there is only one way to find out. Will someone please fund my trip to a major Japanese tech convention? I got some words to say to a fancy speaking lady robit. Loved it. But no pic of Sally?